Anyone out there playing Minecraft? 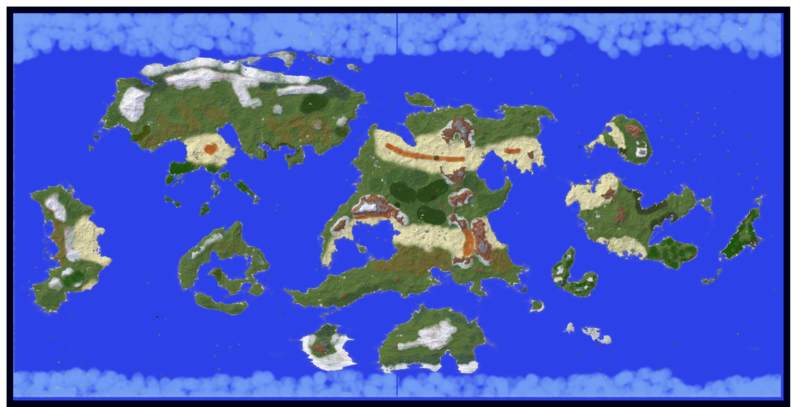 Just for fun, I decided to implement the world of Nibirum from the community atlas into Minecraft. It is now available on the atlas download page. Now, the CC3+ atlas maps do not follow the FT3 map faithfully, it is more used as a loose guideline, and to provide the continent shapes, but many mappers ignore things like altitude from FT3. Unfortunately, generating a proper height map from the CC3+ maps is not an easy task, because they do not contain height data, so I had to go to the FT3 source. This unfortunately means that while the Minecraft map is a very good representation of the FT3 world, it will deviate from the CC3+ maps a bit, but there is no helping that. 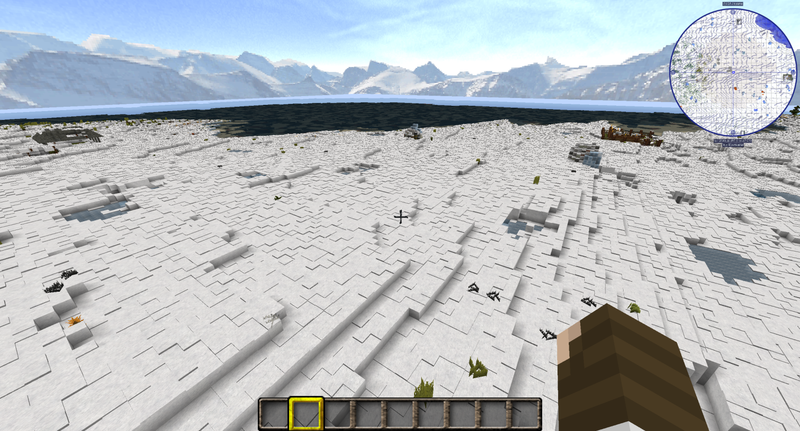 Additionally, terrain does not carry over when using a height map, so I did some manual biome painting. I did a rough paint job trying to paint biomes roughly matching the CC3+ continent maps. In the end I did find the result quite interesting, although it can certainly be made better but that would take much manual work. Except for the heightmap data for the continents, the rest of the features are generated by Minecraft as per a normal Minecraft map so don't expect to find villages that match up with the location on the atlas maps, I don't have any control over where Minecraft places villages, temples and other structures. I do think this map does a nice job in allowing you to explore Nibirum "in person" instead of just looking at a map. This map is for the Minecraft Java edition. I have no idea if it can even be imported into any other version. The map itself is about 30000 by 15000 blocks, where each block roughly represents 1 square mile on Nibirum. This map is populated with normal Minecraft resources and structures, so it is a fully playable survival world. The software I used to accomplish this was World Painter to import the height map and generate a minecraft map from it and then I used the Chunk Pregenerator to force Minecraft to populate all the chunks on the map with the various features (caves, mineshafts, runins, villages, trees, etc) without visiting everywhere. Additional structures where also added at this stage by Recurrent Complex. Here are some screenshots I took while in game. Note that this map is so huge that it is impossible to take screenshots of larger features like landmasses. You can click any of the screenshots for a higher resolution version (There is also a 30K resolution version of the world map from above, but beware, it is 200MB). A view from the continent of Alarius. A handy teleporter I set up at spawn that can quickly get you to another continents. I still have my hands full of other stuff, or I might be tempted to dabble a bit. The background glaciers or icebergs (or whatever they are) look the same in each image. Is that some kind of a general backdrop that stays the same wherever you look? Yes, that's just the skybox. They're not related to the map itself. Can you switch it off if you get tired of the background view? Skyboxes are a common concept in games. Rendering the world out to infinity is a very expensive operation, so all games will only render the part of the game world somewhat near to the player, and then use a skybox to give the illusion that there is still more out there. Normally you wouldn't see so much of it, but I took most of those screenshots hovering a bit over the ground, so you can actually see where the world stops rendering in the distance, but when walking normally in game, that point is normally always hidden from view, unless you stand on top of something tall that gives you a similar view. This is pretty neat. Not into Minecraft, at all (i'm more of an RPG video game player), but i really like the visuals we can see of our wonderful world! I don't play it too much myself (although I love doing a heavily modded version every now and then, or a custom adventure map with friends, but just "plain" Minecraft bores me). But it does have a unique kind of flexibility, which makes it the ideal target for projects such as this. Honestly not sure if I ever will play this map myself, making it was the most interesting part for me. Nope,not me, but my sister's kids play it.